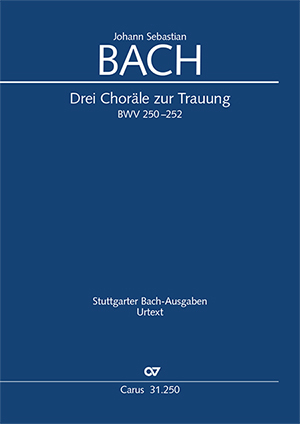 Among Johann Sebastian Bach’s largely unknown vocal works is a compilation of wedding chorales which have survived in an autograph set of parts from the 1730s. These are four-part chorale settings of well-known hymns for treble voices accompanied by two horns, colla-parte strings and continuo. The chorales can still be performed today at weddings without any great difficulty. .... Die drei Choräle zur Trauung („Was Gott tut, das ist wohlgetan", „Sei Lob und Ehr dem höchsten Gut", „Nun danket alle Gott") bilden die Musik zu einer „halben Brautmesse" und stellten wohl ein Repertoire des Thomaskantors für Trauungen dieser Art dar.